Once being called Mozilla Weave Sync is now changed to Firefox Sync. 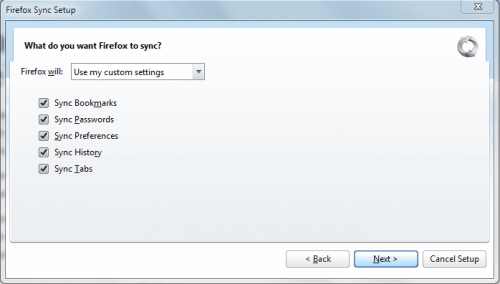 The Mozilla developers have changed the name of the synchronization add-on for the Firefox web browser. There is no new of Why they have done so ? but Firefox Sync name is much more descriptive then Mozilla Weave Sync. A new version of Firefox Sync was released as well (Firefox Sync 1.3b5) which offers considerable advantages over earlier versions. This includes an improved response time, a new production server clusters built to handle larger loads, client user interface facelift and more. The full list of changes is listed in the release notes. 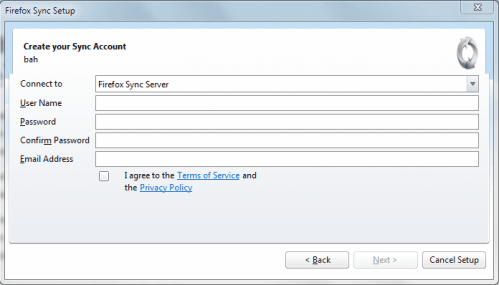 Take a look at the screenshots below to see how easy it is to configure Firefox Sync to backup browser data that can be restored and synced with other devices. Data can be stored on Mozilla servers or custom servers. 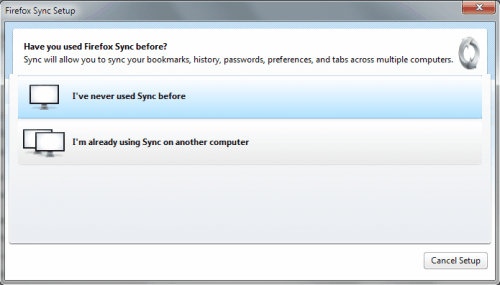 Firefox sync supports continuous synchronization of the bookmarks, Firefox preferences, browsing history, saved passwords and tabs. Existing Firefox Sync users can log in while new users need to create an account first. The Firefox Sync server (Mozilla or custom), username, password and email address need to be configured in the Sync account creation window. A secret phrase needs to be entered which will be used to encrypt and decrypt the data. The data that should be synced can be selected in the next wizard window. It is possible to sync everything or only specific data sets. A captcha appears on the screen afterwards which feels a bit strange. The setup completes afterwards and Firefox Sync will appear in the status bar of the web browser indicating that it is performing the initial syncing of data to the selected servers. The latest version of Firefox Sync can be downloaded from the official Mozilla Labs website. A click on Experimental version next to Download Weave now will download and install the latest beta version of Firefox Sync.